Learn more about advanced lightware functionals. The Alternative (Active) Light Wire Functional (ALF) appliance was developed by Dr. Darick Nordstrom of Hollister, California in the early 1980´s. Dr. Nordstrom observed that after the correction of the malocclusion (misalignment) of the upper and lower jaw, the patient would report relief of TMJ pain, facial pain, neck pain, chronic headaches and shoulder pain, along with other seemingly unrelated symptoms: fatigue, poor sleep, digestion problems, ringing in the ears, hearing loss, light sensitivity, sound sensitivity, throat pain etc. These observations by Dr. Nordstrom and the development of the ALF appliance has allowed for the restoration of the patient’s jaw function, improved patient oral health and overall quality of life. Since discovering the ALF appliance, Dr. Nordstrom has constantly improved the ALF appliance design and ALF treatment approach. The ALF (Advanced Lightwire Functional) Appliance is a light wire appliance that Dr. Bradley Oldfin fits to the dental arches to provide a continuous light force to the jaw bones and teeth, which is more beneficial that applying heavy continuous forces. Correct upper and lower teeth alignment which improves the bite. Skull bones and jaw bones can have structural distortions. These structural distortions can develop from birthing trauma, genetics, environmental (i.e. mouth breathing due to enlarged adenoids and tonsils), epigenetics, or trauma (i.e. motor vehicle auto accidents, contact sports injury or any trauma to the head). The patient evaluation involves a combination of a clinical exam, imaging (cephalometric x-ray – lateral view of the skull; panoramic view ­ full jaw survey, full mouth series, CBCT, or MRI’s), diagnostic casts of the patient’s teeth and photographs of the face and teeth. Once the diagnostic records are completed and analyzed, Dr. Bradley Oldfin will develop a customized treatment plan for your individual needs. 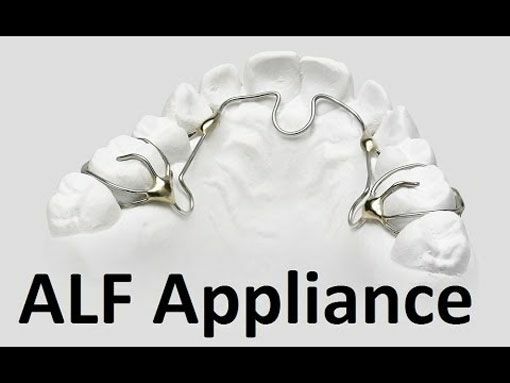 The active ALF appliance treatment time can vary from 18 to 36 months and the technique is customized to the needs of each patient’s skeletal and dental distortion problems in order to allow for its correction. Book a consultation today to learn more about how ALF Orthodontics can benefit your child. Dr. Bradley Oldfin has extensive training in airway development, craniofacial orthopedics, orthodontic treatment, TMJ disorders and snoring and sleep apnea. He has over 20 years experience treating children and adults with various customized oral orthotics.